There has literally never been a better time to order from Tiny Prints. If you're not familiar with their top-notch, classy stationery, you should be. Whether you need birth announcements, graduation party or baby shower invitations, photo iPad cases or notebooks, and any of your personalized stationery needs, Tiny Prints has it all. Oh and the part about there never being a better time? That's because their birthday is this week and from now through March 4, 2014, they are giving you the gift of 30% off everything. That's their best deal of the year. Visit them now and choose from any of their products and when you check out, use the promo code BDAY10 to save 30%. Happy Thanksgiving everyone! From now through 11:59pm PT December 1, 2013 get 25% off any order! Terms: Offer expires 12/1/2013 at 11:59 pm (PT). Enjoy 20% off your order using the code THANKS13 at checkout. There is no minimum purchase required for this promotion. This promotion code cannot be combined with other offers. Offer is not applicable to previously placed orders, shipping, taxes, rush processing charges, and excludes photo books, calendars, gift certificates and items from our Thermography, Letterpress, Foil Stamping, and Engraving collections and our Professional Printing Service. Offer is only valid on Wedding Paper Divas and is not applicable to third party or partner websites. To prevent abuse, we reserve the right to discontinue or modify this offer at any time without notice. We reserve the right to cancel any order at any time. Tiny Prints Labor Day Weeklong Sitewide Sale: 25% off Any Order! From now through September 3, 2013, save 25% on any order on TinyPrints.com. Use promo code LABOR13 during checkout. There is no minimum purchase required for this promotion. Hurry, this will expire 09/03/2013. This offer cannot be combined with other offers. This offer is not applicable to previously placed orders or toward the purchase of greeting cards, gift cards, gift certificates, calendars or photo books. Offer is only valid on Tiny Prints and is not applicable on treat.com, third party or partner websites. To prevent abuse, we reserve the right to discontinue or modify this offer at any time without notice. We reserve the right to cancel any order at any time. Offer expires 9/3/13 at 11:59 pm (PT). July 4th Week long Sitewide Sale: 20% off Any Order! From now through 11:59pm PT July 9, 2013, save 20% off all orders using the code JULY4 at checkout. There is no minimum purchase required for this promotion. This offer cannot be combined with other offers. This offer is not applicable to previously placed orders or toward the purchase of greeting cards, gift cards, gift certificates, calendars or photo books. Offer is only valid on Tiny Prints and is not applicable on treat.com, third party or partner websites. Offer expires 7/9/13 at 11:59 pm (PT). 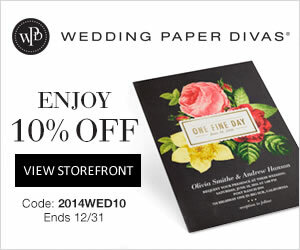 Wedding Paper Divas Sitewide Sale: 20% off your order! From now through 05/07/2013, enjoy 20% off your order at Wedding Paper Divas using the code at 20MAYSW checkout. There is no minimum purchase required for this promotion. Offer expires 05/07/13 at 11:59 pm (PT). Click here to get started! 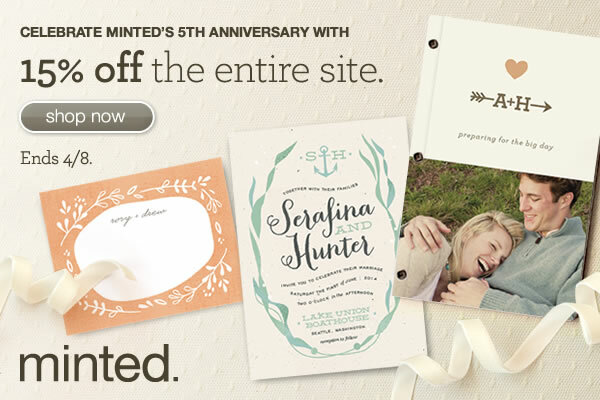 Minted.com is celebrating its 5th anniversary with a 15% off sale. Take advantage of this and save on wedding invitations, baby announcements, as well as their new line of party decor and limited edition art prints. Hurry, this sale ends 04/08/2013. Choose your own savings this week at American Bridal! Use the codes below to save site wide -- buy more and save more with up to 25% off PLUS free shipping. Coupons, sale prices and free shipping offer valid Monday, March 4th through Sunday, March 10th. Free shipping applies automatically to all orders $175 or more before tax.